Singapore Kid's Places: Liverpool in Singapore tonight! We are all very excited to be attending the Liverpool match at the National Stadium tonight. This will be my first ever football/soccer match and of course the kids' too. Although I don't follow a particular team (OK, for now I follow Liverpool), I'm sure it will be fun. We missed the team floating down Singapore River in bum boats yesterday. Apparently there were 20,000 fans in their red and white lining the river, waving flags and scarves. That would have been a sight to behold! 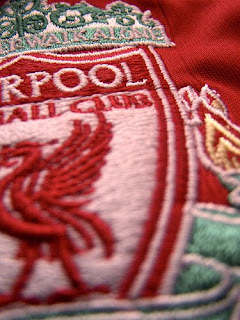 For the full story with photos, check out the official Liverpool Football Club site. The team members have been going on a bit of a PR blitz over the weekend, greeting fans at shopping malls, and entertaining fans at their training session on Friday night. But it is disappointing that Steven Gerrard won't be playing and striker Fernando Torres won't be on the pitch for more that 15 minutes. Ah well, just to soak up the atmosphere, see the players in the flesh and enjoy some first class football will be a treat for us all. I was there at the National Stadium and I am a long time Liverpool FC supporter !!! Great atmosphere, no simple words to describe ..... my photoblog & personal blog posts would have my fanatic chasing during their stay here.